On this screen you can tell the gadget where you are. The gadget will display details about the aircraft that is closest to this location. If you happen to know the latitude and longitude of your location then you can enter them here. Enter a positive latitude for north, negative for south, and a positive longitude for east, negative for west. 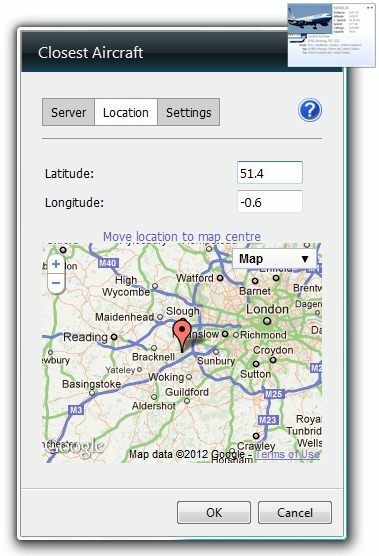 Clicking this link moves the pin to the centre of the map. It also updates the Latitude and Longitude fields. You may set your location by moving the pin on the map. This is probably the quickest way to set the location. Moving the pin on the map also updates the Latitude and Longitude fields. You can switch the map into Satellite view but this is slightly slower than Map view, so you may want to get your rough location in the map, zoom in a bit, click Move location to map centre then switch to Satellite view and drag the pin to your precise location.